CinchLock Model: CL Temporary Door Lock The CinchLock is a temporary door lock for classrooms and offices. The CinchLock works on outward opening doors. 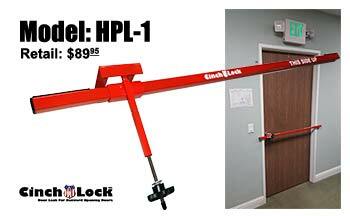 CinchLOCK HPL-1 is a temporary door lock for outward opening doors. The sturdy steel bar and locking mechanism are powder coated in safety red. The locking mechanism can be used on both right and left opening doors as well as doors with safety bars (requires a minimum 1/8" gap between safety bar and door). This versatile design also allows you to use the same unit on doors with handles or Panic Bars at different distances away from the door frame. 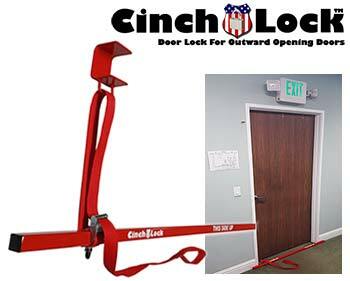 Designed as a solution for doors where our popular under-door CinchLOCK cannot be used, The CinchLOCK HPL-1 provides an extra level of security in lockdown situations. 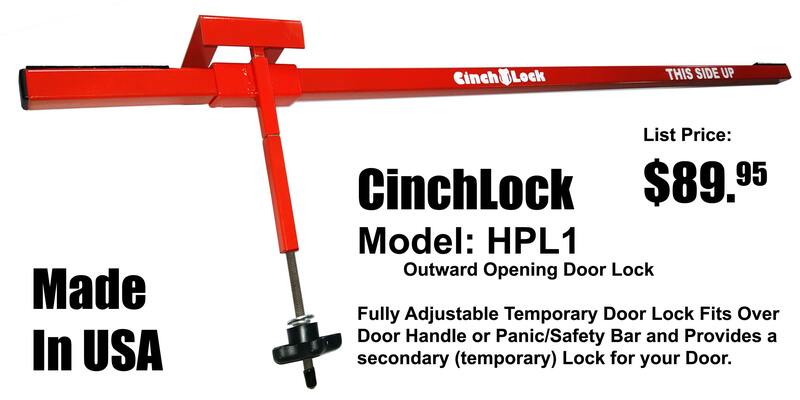 CinchLOCK HPL-2 is a temporary door lock for outward opening doors. 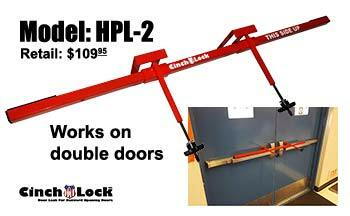 Designed as a solution for doors where our popular under-door CinchLOCK cannot be used, The CinchLOCK HPL-2 provides an extra level of security in lockdown situations.